Marie Osmond was first thrust into the spotlight in 1963 on “The Andy Williams Show” at age three, went on to record “Paper Roses” at age 12 and became the youngest host of a national variety show “The Donny & Marie Show,” which ran from 1976 until 1981. 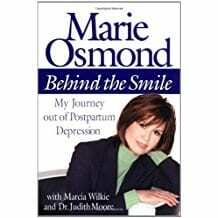 In 2001 Marie was the first-ever celebrity to publish a book about her experience with Postpartum Depression, “Behind the Smile” followed in 2009 by “Might As Well Laugh About it Now”. She continues to perform her show around the country. Beginning with her national debut at age three on The Andy Williams Show, Marie has proven to be a resilient talent with a magnetic presence recognized across generations. Entertaining for five continuous decades is a rare accomplishment, achieved by very few women. Marie recorded “Paper Roses” at age 12, making history as the youngest female artist to have her debut record go to #1 on the charts, followed by a Grammy nomination. She still holds the record as the youngest host of a national television variety show, The Donny & Marie Show (1976-81);”appointment television” for millions of viewers. As a recording artist with over 35 albums and numerous gold records, a standout career highlight was a Country Music Association’s “Vocal Duo of the Year” Award for “Meet Me In Montana.” The new single “A Beautiful Life” soared to up the charts to # 1 in 2012. Beckoned to the Broadway stage in the mid-1990’s, Marie starred in The Sound of Music and The King and I, which garnered rave reviews on national and international tours. In 2001, Marie’s was the first-ever celebrity to publish a book about her experience with Postpartum Depression, Behind the Smile, followed in 2009 by Might As Well Laugh About it Now. Both books were New York Times bestsellers. Now celebrating 22 years, Marie Osmond Dolls has received many “Dolls of Excellence” and “Doll of the Year” (DOTY) awards (4 awards in 2011) and nominations; making Marie one of the top doll designers in the world. As co-founder of Children’s Miracle Network, the largest and top-rated children’s charity in North America, Marie has helped to raise 4.3 billion dollars in 30 years with one hundred percent of all funds going to the children. Since September of 2008, Marie has continuously performed five nights a week to sold-out crowds at the famous Flamingo Hotel Showroom in Las Vegas with her brother, Donny. “Donny and Marie” 2012 won top honors from the Las Vegas Review, when their show was voted “Best Show” and “Best All Around Performers” in Vegas. To add to her long and varied career, October of 2012 is the launch of Marie! a one-hour talk and entertainment show nationwide.